The Hobbit is one of the greatest fantasy sagas of all time, a classic that has captivated generations of readers and is now an eagerly anticipated film by Peter Jackson, Academy Award–winning director of the Lord of the Rings trilogy. 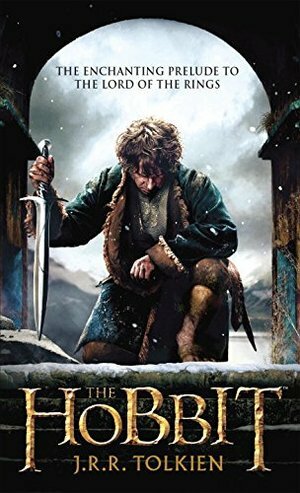 When Thorin Oakenshield and his band of dwarves embark upon a dangerous quest to reclaim the hoard of gold stolen from them by the evil dragon Smaug, Gandalf the wizard suggests an unlikely accomplice: Bilbo Baggins, an unassuming Hobbit dwelling in peaceful Hobbiton. Along the way, the company faces trolls, goblins, giant spiders, and worse. But as they journey from the wonders of Rivendell to the terrors of Mirkwood and beyond, Bilbo will find that there is more to him than anyone—himself included—ever dreamed. Unexpected qualities of courage and cunning, and a love of adventure, propel Bilbo toward his great destiny . . . a destiny that waits in the dark caverns beneath the Misty Mountains, where a twisted creature known as Gollum jealously guards a precious magic ring.© New Line Productions, Inc. All rights reserved. THE HOBBIT: AN UNEXPECTED JOURNEY and the names of the characters, items, events and places therein are trademarks of The Saul Zaentz Company d/b/a Middle-earth Enterprises under license to New Line Productions, Inc.